June 30th Milwaukee welcomes The Fray to Summerfest. They don't like to be compared to a Christian band such as Jars Of Clay, but hey, if the market wants to label you, then go with it. (kidding) Others think that The Fray is more like Coldplay. I have never heard the band so I cannot comment on this one. I have heard Coldplay. I hope The Fray isn't like coldplay. That's one band I just don't get. So far, the Summerfest line up is rounding out nicely. Some country, some rock, some old, new, etc. 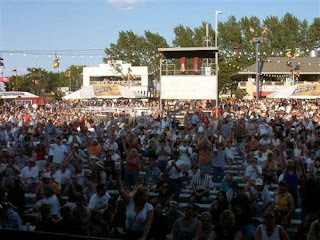 Now bring on those often overlooked side stage show announcements for Summerfest.